A Singing Celebration is an opportunity for everyone to get in touch, through singing, with his or her own musicality. We explore the dimensions of the sounds produced by the human voice and delve into these dimensions in a climate of playfulness. 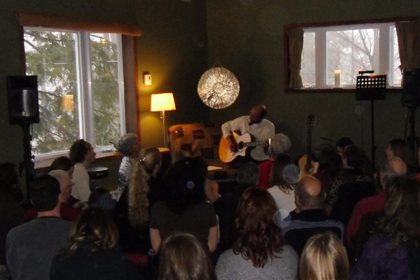 Singing becomes a celebration where a heartful synchronicity can easily be experienced by everyone. No musical knowledge is needed to participate. In fact, you learn to trust your own voice. I use songs from many sources: mantras and kirtan chants; Native American, gospel, Sufi, African, French, English, Portuguese songs; and my own compositions. It is thrilling to explore the sonorities of different languages in songs. The guitar, which I play as support, is easy and inspiring to sing with. Sometimes I invite musician friends to accompany me. Through feed-back (in French, English or German as necessary) I help you to become aware of your innate ability to listen and how it can expand and deepen your own musicality. The Singing Celebrations can be dynamic and gentle at the same time. It all depends on the depth of sensitivity, moment by moment. The power that comes from sensitivity has a different flavor to a power that is forced. The voice is a wonderful mirror; it easily reflects this principle. When musical sensitivity is present, whatsoever happens turns out right. The same is the case with singing in tune. Once you start listening to your own voice and of those around you, disharmony disappears on its own accord because the voice has a natural tendency to harmonize. You don’t even need to understand what is going on – it all happens naturally. It is magic! Sometimes people tell me that they can’t sing. That is not a problem and it is not true. I simply encourage them to start listening – and the voice will follow naturally, in its own time. The Singing Celebrations usually last for two hours and in Canada happen twice a month with thirty to forty people at a time. I have also worked with larger groups numbering over two hundred people. For dates of the next celebration see calendar on the right. Read my article Singing Celebrations: A Master Recipe! Lisez mon article Les ‘Singing Celebrations’: Une recette gagnante! Music and singing are simply the most wonderful excuses to share this unlimited space that we all carry within. And music can invite this treasure in such a gentle way.